CHICAGO (AP) The Chicago Bulls got their first taste of life with Zach LaVine and liked what they saw. 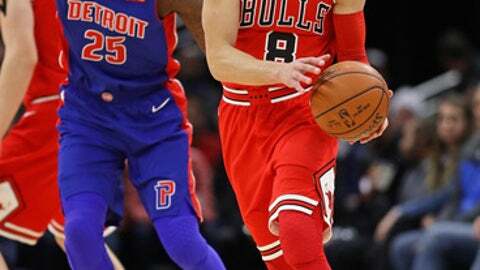 LaVine scored 14 points in his first game in 11 months, rookie Lauri Marrkanen added 19 points and the Bulls beat the Detroit Pistons 107-105 on Saturday night. Chicago made 17 3-pointers and held off several late charges by the Pistons to win for the 13th time in its last 20 games. LaVine was making his Bulls debut after being acquired from Minnesota in the Jimmy Butler trade. LaVine, who last season averaged 18.9 points in 47 contests, hadn’t played since he suffered a torn ACL against Detroit on Feb. 3. Avery Bradley scored 26 points and Andre Drummond had 21 and 15 rebounds for Detroit, which lost its sixth road game in seven tries. Coming off a career-high, 33-point effort on Wednesday, Markkanen hit a 17-foot shot with 1:08 to go to give the Bulls a 106-105 lead. The game featured 23 lead changes and seven ties. Chicago then survived four late shot attempts by Detroit, including a missed layup by Drummond with 38 seconds left. It was the second straight close victory for the Bulls after an overtime win at New York on Wednesday. With LaVine on the court, the Bulls reached 100 points for the 17th time in 20 games after reaching the mark only eight times in their first 23 contests. LaVine made his first shot, a 27-footer from the right of the key, before he assisted Robin Lopez’s basket inside. The fourth-year guard followed with an easy 15-footer at the 8:12 mark in the first quarter to give Chicago an early 12-11 lead. LaVine made 5 of 9 shots and finished with two assists. Kris Dunn had 18 points, eight assists and eight rebounds for Chicago. Dunn also was credited with a blocked shot on Reggie Bullock’s attempted layup at the buzzer. Nikola Mirotic had 16 points and six rebounds off the bench and Bobby Portis scored 15 in the win. Eight of Drummond’s 15 rebounds were on the offensive end, which helped Detroit to a 30-6 advantage in second-chance points. Bulls: Connected on 17 3-point tries to match the franchise record with a seventh consecutive game with at least 10 3-pointers made. Chicago made its first six tries from beyond the arc, including all three by Markkanen, to equal the previous stretch from March 21-April 2, 2017. Upset he missed a wide-open, 3-pointer to give the Bulls the lead, Hoiberg said Markkanen apologized to his teammates in the huddle. Hoiberg drew up the next play for Markkanen, who hit the go-ahead shot. Pistons: Host Charlotte on Monday. Bulls: Host Miami on Monday.